Just like a great performance or event, any meal hoping to make a lasting impression needs a grand finale – dessert! Pastry chef Christopher Siu elevates the sweet course with some of the most inspired confections you will ever see. The MasterChef Canada season two competitor (he finished in the top five) recently opened his second DaanGo, home to a range of Instagram-hungry desserts, from cute character-based macarons and treats to show-stopping cakes and pastries. Baking since he was six, Siu, a trained pharmacist, parlays his passion into both a science and an art with exacting techniques and unique Asian-fusion flavours. 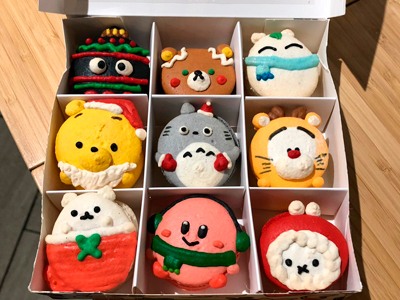 DaanGo – it means cake in Chinese — fills its shops with a rotating menu of macarons, both plain and adorned with adorable faces. Available for catering as macaron towers or as box-packaged gifts, they come in 18 flavours; try the non-traditional ones, like Uji matcha, Vietnamese coffee, Ovaltine and roasted milk tea. Other signature treats include Tira-Meow-Su, a delectable take on classic Tiramisu served in an edible chocolate teacup topped with the cutest marshmallow cat. There’s also an awesome cake portfolio. The bakery does custom orders – not over the holiday season, though. However, its Christmas-themed treats are launching soon and will be available for corporate and catering order.